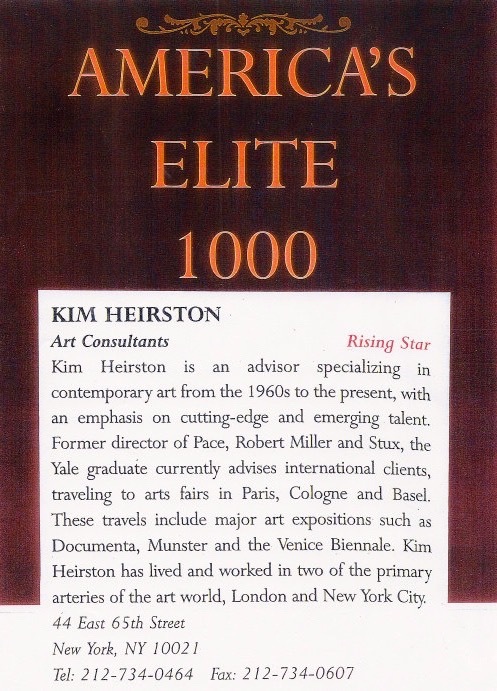 Kim Heirston is an advisor specializing in contemporary art from the 1960s to the present, with an emphasis on cutting-edge and emerging talent. Former director of Pace, Robert Miller and Stux, the Yale graduate currently advises international clients, traveling to art fairs in Paris, Cologne and Basel. These travels include major art expositions such as Documenta, Munster and the Venice Biennale. Kim Heirston has lived and worked in two of the primary arteries of the art world, London and New York City.